It’s a great thrill to be able to report on the work that a former student of ours will commence later this year. Rita is a Lithuanian national who has been in the UK for six years and during that time has completed our BA and is about to finish her MA in Mission Studies. She and her husband Vidas, have been sensing a call to work in the UK among Polish migrants. This is a tough assignment for them as their home churches in Lithuania are not wealthy and therefore not able to offer much in the way of financial support. Secondly, there are real sensitivities surrounding the fact that many Polish migrants have a Roman Catholic background and although they may be less likely to attend Mass after moving to the UK, their background cannot be ignored. Rita will be learning Polish and spending a lot of time trying to understand how best to engage in mission with non-practising Roman Catholic Poles living in the UK. Render to Caesar… but Peter’s successor would like a slice please. The staff of the Nova office are currently enjoying the rather more relaxed environment of a college empty of students. In the absence of ‘hard’ research-led European mission stories today, here’s a ‘summer holiday’ story which made us smile. The Vatican has been issuing its own Euro coins since 2002, reports EUObserver, and has recently begun minting €2.3 million annually. At least 51% of those coins must be circulated at face value. This follows the previous practice of only selling the Vatican’s Euro coins as collectors’ sets – and sold at a sum higher than the face value of the coins themselves. Earlier issues of the coins had been restricted in numbers and this has tended to force up the street price that can be charged. There may be an investment opportunity here for those quick to spot a bargain and it would, presumably, count as an ethical investment? The World Evangelical Alliance reports on a recent religious liberty gathering in Rome which culminated in a gathering at Campo de’ Fiori, the place where ‘heretics’ through the centuries have been burnt. The event organisers, including the Italian Evangelical Alliance, called for fairer treatment and more equitable access for religious minority groups by the state broadcaster RAI. Patriotism is a particularly potent shaper of national identity myths. It’s difficult to escape this conclusion at the end of tonight’s 4th July concert here in small town Kentucky. The setting is spectacular; a balmy summer evening sitting around the county hall square with several thousand concert-goers listening to the Louisville Symphony Orchestra. The music is stirring; a programme designed to inspire and quicken the patriotic pulse by Copeland, Sousa, Harris, and Foster. The finale is truly moving, the promised ‘final bang’ is delivered with flawless timing. As I promptly get to my feet to join the standing ovation at the concert’s conclusion I am genuinely engaged by the power of the music to evoke emotion and fervour. The music, the military symbolisms, the flags, the anthems. Each of them, aptly summed up in the words of the Orchestra’s conductor, an expression of, and testimony to, the freedoms enjoyed by the concert-goers. For this was America, the ‘land of the free’. My memories take me immediately to another land, far away, that is equally convinced of its own national destiny. I can remember shivering outdoors in the icy depths of winter as proud Russians were as fervently convinced by their own mythologies of the ‘motherland’. As a British citizen, in the face of two powerful and competing alternative patriotisms, I am at a loss to know how to respond. As a European citizen I am scarcely able to summon anything that might pass for patriotism; all such symbolism was stripped from the draft Constitution long before it got to the starting line. However, as a citizen of God’s transforming reign, I am both profoundly encouraged and profoundly disappointed. The reasons for this are reasonably obvious to me, although I suspect there is a much greater subtlety to the issues than I am immediately able to summon for a blog like this one. I am disappointed by my suspicion that all such national identity myths are derivative of our created identity as ‘icons’ of God and of the Christian notion of a redeemed identity re-created in the likeness of Christ. Despite this, I am encouraged by a longer term eschatological perspective that describes the way that the Christian story of our origin and destiny will trump all alternatives that are limited in their scope to any particular nation, tribe, or tongue. I am encouraged that true freedom is no stranger to the prison cell, the torture block, the gallows, or even the cross. I am encouraged by the essential Christian vision of disciples who are pilgrims in lands that feed, clothe, and sustain them. Yet, each of these lands will one day have to relinquish their claims to the loyalty of their citizens and will have to cast their golden crowns, flags, and patriotic symbols before the throne of the Lamb. Perhaps, at a very human level, I am also encouraged that deep down there is another factor at work. Our concert ended with a very un-American rendition of Pytor Illiyich Tchaikovsky’s ‘1812’ overture, accompanied by the artillery of the Kentucky State Guard. Aaron Copeland and Tchaikovsky are fine examples of composers of patriotic music. If the tapping feet, the humming, and the many people surreptitiously accompanying the conductor’s baton indicated anything, it suggests that the best music retains a capacity to transcend its patriotic origins. Quite simply, the ‘1812’ overture and Copeland’s Fanfare for the Common man belong to the world, they belong to everybody. If great music is able to subvert its patriotic intentions, we can have greater confidence that the good news of Christ is not only for the Jew and the Gentile in all their cultural, ethnic, and national uniqueness, but that it is ultimately good news for the Jew and the Gentile beyond all cultural, ethnic, and national mythologies. Two of the pieces that made tonight’s audience smile were those that offered variations of excerpts from more than one popular American tunes; Arthur Harris’s ‘Americana’ and Morton Gould’s ‘American Salute’. They got me looking forward to sitting down to listen to a performance at some point in eternity that is titled ‘Symphony for the kingdom’. I wonder which great musical works such a symphony would quote from? We’ll be archiving copies of VISTA here as a way of making it more widely available. 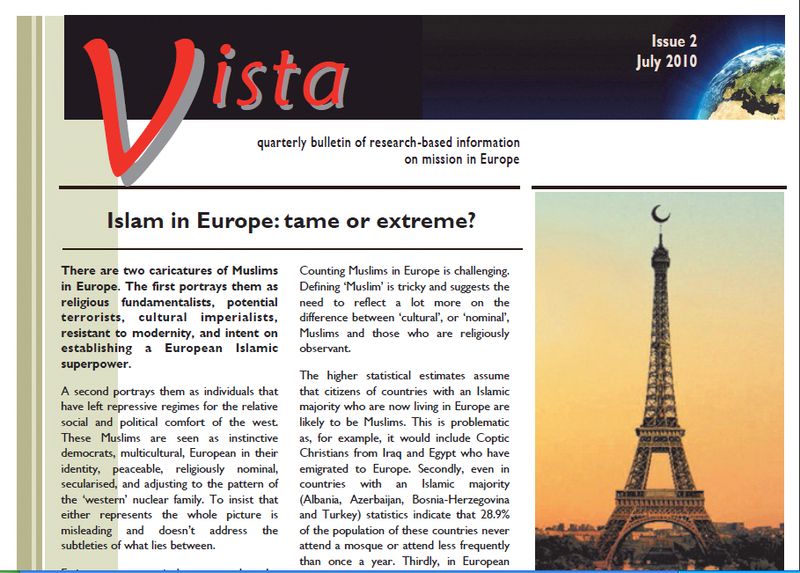 VISTA is our quarterly bulletin and continues our commitment to quality communication of research and innovation in European Mission. 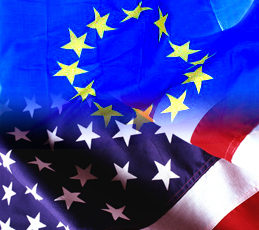 The first two Issues carry research-led stories about Migration in Europe and Islam in Europe. You can access these pdf files by following the page link at the upper right hand side of our blog’s page. Please feel free to leave your comments in response to what you read here. We hope you enjoy reading VISTA!